They exist! 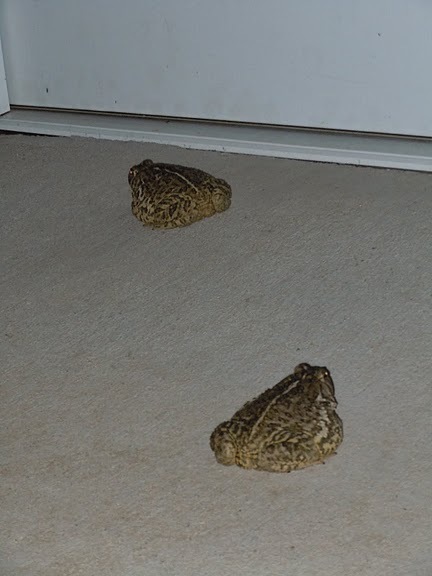 Mom and Dad swore to me they had a trio of toads that staked out the patio in front of the barn, but I haven’t seen them. Until now! Look! Toads. They look like warty pancakes. Well. I’ll be buggered. Or not, since the toads are hanging out, eating bugs! The internet says they are Great Plains toads, Bufo cognatus. Sounds like ‘thinking diver’ to me, but my Latin is entirely made up. This site says they are worth $25 per toad to farmers in Oklahoma, because they eat pests! This entry was posted in animals and tagged plains toads, toads. Bookmark the permalink. Thanks! I try to keep it fun. And it’s easy, with so many cute animals running around!